CablesPlus USA provides LightWave MTP to LC Fiber Optic Cable configurations up to 144 strands of fiber. You can perform a variety of tasks with efficiency when you choose the LightWave line of fiber optic cables. Harnessing the power, durability and space-saving capabilities of the MTP brand MPO-style connector, the MTP-LC fiber optic cable's compact design tackles the dual challenge of high fiber-count applications and limited space restrictions. Take advantage of the MTP brand connector's superior features, including removable housing and innovative spring design, which help prevent fiber damage and prolong the high performance quality of your MTP-LC fiber optic cable. On the other end of these cables, you have the LC connector, the most popular of the standard connectors, highly touted for it's excellent performance in both Singlemode and Multimode applications alike. Both connector ends make this cable easy to install and disengage with push-pull functionality. 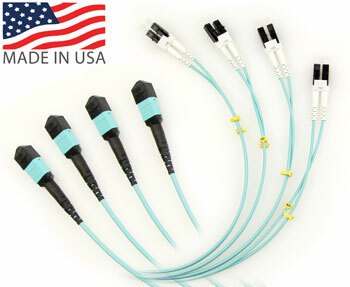 Our MTP-LC fiber optic cables are assembled in the USA, and are individually tested to make sure you receive the highest possible quality, and the results of each test are included with the product. In addition to high standards of American-made quality, LightWave brand MTP-LC trunk cables also fully comply with standards of the Trade Agreements Act (TAA), making these cables eligible for U.S. Federal Government use. Plenum rated cassettes also available. Build your new custom MTP cables and purchase them online!